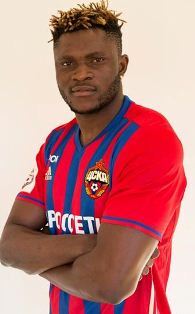 Nigeria international Aaron Samuel has revealed that he is nearing maximum match fitness ahead of the resumption of the Russian Premier League. The former Guangzhou R&F star will be hoping to be given a run out when the Muscovites face off against Zenit St Petersburg on Saturday, March 4. “I train with the team for two weeks, I can say that I gradually approach the ideal condition, ” Samuel told bobsoccer.ru. “Maybe I’m not ready at 100% start to the match and play from the beginning to the end, but I’m sure that the first official match my condition is almost optimal, and I’ll be ready to play from the first minute. Samuel, 22, has not played competitively for club and country since he got injured in the Russian Cup final against Zenit on May 2, 2016.